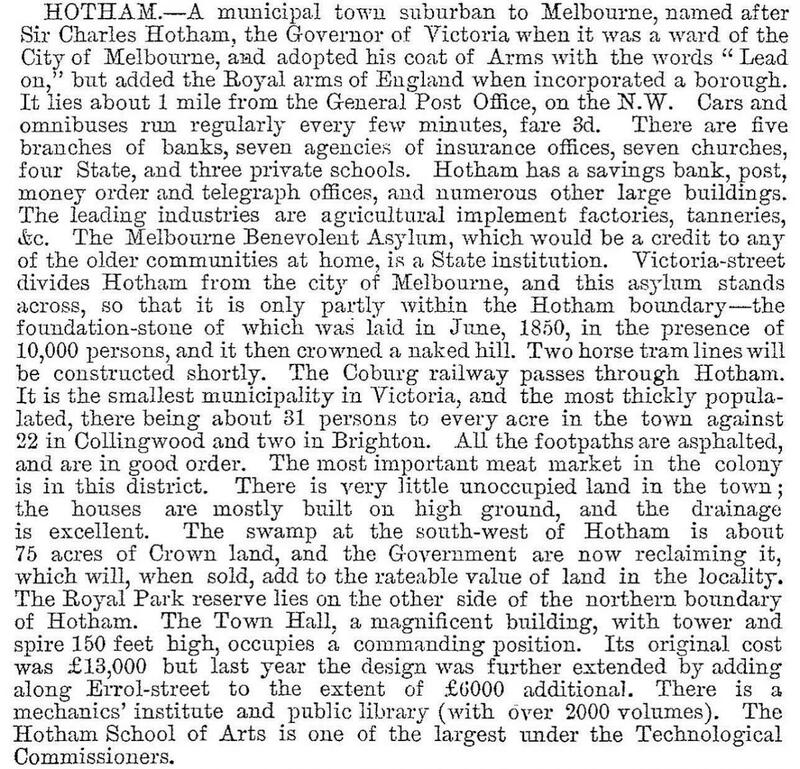 Hotham was the name given to North Melbourne during the period 1855-87. In April 1855, the Melbourne city council rearranged its wards, creating a separate ward for the township that had developed to the north-west. The ward was named Hotham, after Sir Charles Hotham, Governor of Victoria (1854-56). The township was rapidly filled up by residents who were mostly gold rush immigrants. On 30 September 1859, it became the Borough of Hotham by severance from Melbourne city council. The area of the borough was a little over 500 acres (2 sq km). On 26 August 1887, the town was named North Melbourne. After North Melbourne was amalgamated with Melbourne city council in 1905 it was united with Flemington and Kensington as one ward. In 1939 the council’s wards were reconfigured to accord with an equality of voting (albeit the property based plural voting) and most of North Melbourne was in the Hotham ward. The name ‘Hotham’ was later given to a Housing Commission high rise estate (1961-63) at Canning and Melrose Streets.